LiteSpeed Blog / Products / LiteSpeed Web Server / DirectAdmin Integrates LiteSpeed Web Server into CustomBuild 2.0! DirectAdmin prides itself on being a super lightweight control panel, so it makes sense for them to integrate with the world’s premier lightweight Apache-replacement. 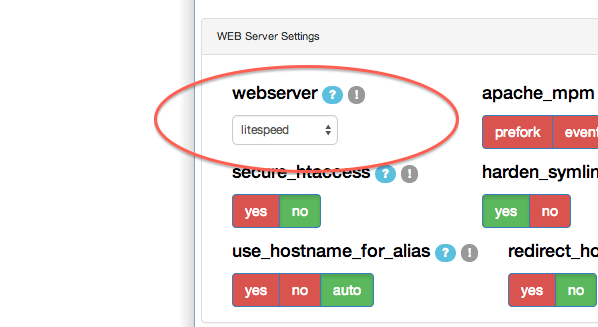 Build and update LiteSpeed Web Server within CustomBuild. Build and update PHP for LiteSpeed (LSPHP) within CustomBuild. Start, stop, or restart LSWS (and see whether it is running) in DirectAdmin’s Service Monitor settings. This added functionality gives DirectAdmin users more convenient control of LSWS. Also, creating a new installation of LSWS through CustomBuild automatically installs a LiteSpeed trial license. So for DirectAdmin users, testing LSWS is just one click away. Most importantly, DirectAdmin being actively aware of LSWS — and knowing whether LSWS is running — improves server stability, allowing DirectAdmin to more reliably interact with LiteSpeed Web Server, both now and as future functionality is added. LiteSpeed Web Server can now be installed and updated using CustomBuild 2.0’s terminal commands or through the CustomBuild plugin (as pictured above). We have published a guide to installing LSWS with Custom Build. The next step will be for us to update our plugin to take into account this new functionality. The current plugin works with CustomBuild 2.0, but some of the functionality is redundant. It is better not to have the same functionality controlled in two separate places. Our revamped plugin will probably still be able to control LiteSpeed licenses, run LSWS on a port offset, downgrade LSWS to previous versions, and give a portal to the WebAdmin console. We’d also like to take a moment to praise DirectAdmin’s developers, especially the incomparable Martynas Bendorius, the developer in charge of CustomBuild. Once we made contact, he jumped into the task of integrating LSWS into CustomBuild 2.0 and most of the ground work was done in just one weekend. We at LiteSpeed were really impressed with his speed and efficiency. Ease-of-use is one of LSWS’s calling cards and we’re glad to be able to offer our users even better DirectAdmin compatibility. What other improvements would you like to see for DirectAdmin functionality?